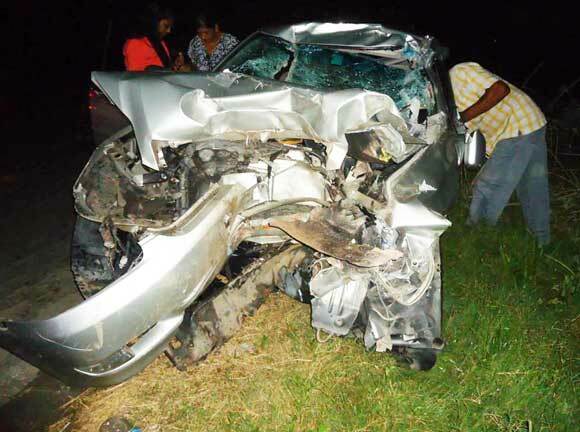 Prominent Berbice doctor, Phyzul Sattaur, 70, of Lot 6 Coburg Street, New Amsterdam was up to late last night in a critical condition in the hospital after he was involved in a vehicular accident while driving his car along the Number 19 Highway last evening. Dr. Sattaur’s badly mangled car. According to reports, Sattaur was driving a Mark II, PJJ 6228, making his way home from a cricket match at the Albion Cricket Ground when he slammed into the back of a lorry, GPP 251, which was heading in the same direction. The Doctor was rushed to the Emergency Room at the New Amsterdam Hospital by a friend after which family and other friends were quickly notified. “His brains showing out…one of his eyes coming out,” stated a friend who was standing by the ICU door of the hospital when this newspaper went there last night. “He can’t make it,” said another. Efforts to transport Dr. Sattaur for further medical attention at the Georgetown Public Hospital were abandoned since his condition was at its worst. Up to press time (after 22:00 hrs) Sattaur was still in a very critical condition at the ICU. Earlier in the evening, senior colleagues in the medical fraternity including Dr. Yacoob and Dr. Narinedatt Sukhnanan were seen consoling his wife, Dholly. Other friends, including the doctor’s clerk were also at the New Amsterdam Hospital. Kaieteur News learnt that Sattaur telephoned his wife around 18:30 hrs telling her that he had left the Cricket match and was heading home. He never arrived. When Kaieteur News arrived at the scene of the accident, pieces of the car were scattered all over the road, along with blood stains. The truck was parked a short distance from the point of impact. The driver of the truck, Mordecai Ramsundar of Number Two Village, East Canje was still visibly shaken from the accident. He stated that he was driving at the regular speed when he heard a loud impact at the rear of the truck. “Me just hear ‘bram’!” he said. “The impact pushed me in a corner,” he added. Dr. Sattaur has four children: Sharrin, Lana, Michelle and his son, Andre. He was educated in Warsaw, Poland in the 1970’s.